Hiring surged in November as employers added 321,000 jobs, crowning 2014 as the strongest year for job growth since 1999. The unemployment rate remained steady at 5.8%, according the government report released Friday. That's down from 7% this time last year. Hiring blew out the consensus forecast from economists surveyed by CNNMoney, who expected a gain of 228,000 jobs. "The number is almost off the charts, given what we've seen over the past 10 years," said Patrick O'Keefe, director of economic research at accounting firm CohnReznick, who does not feel it's an anomaly. "Companies are making up for hiring that was deferred earlier in the cycle." 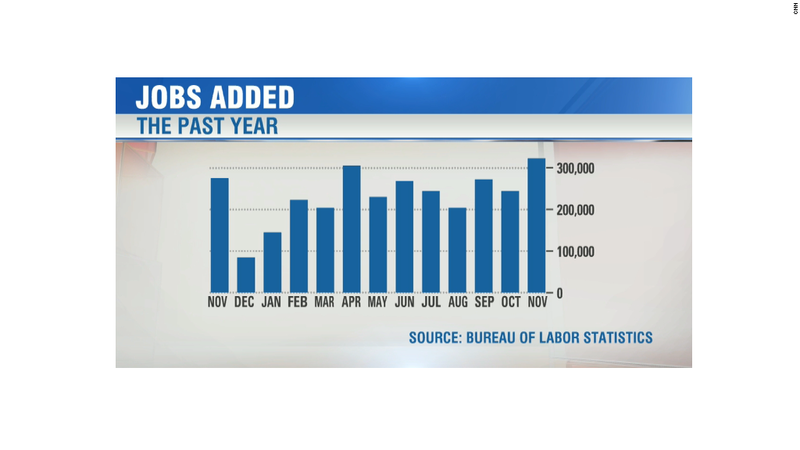 The U.S. economy has been gaining an average of 224,000 jobs a month over the past year. 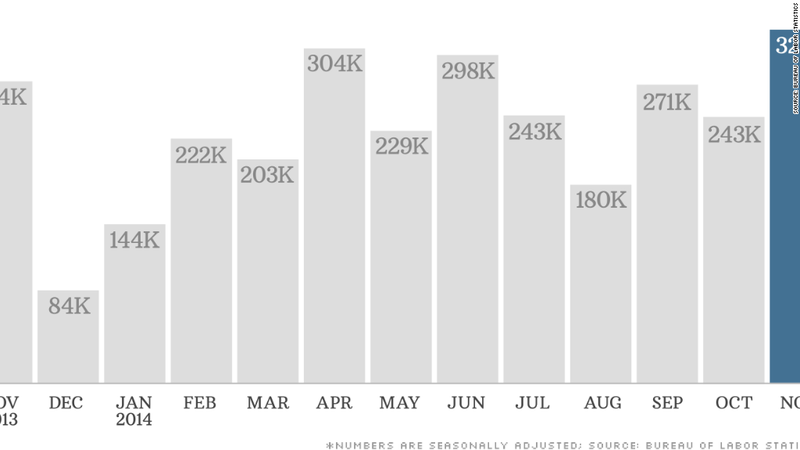 Any month with job gains over 200,000 is considered strong. Americans found employment in a wide array of industries. Professional and business services added 86,000 positions, with particularly strong hiring in accounting and book keeping. 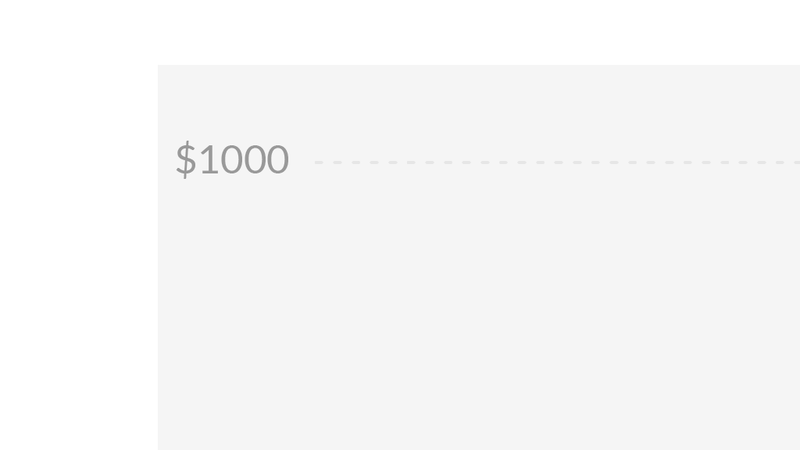 Share your story: Have you found a better paying job recently? Retail trade employment rose by 50,000, thanks largely to increased hiring by car dealerships and clothing stores. Many companies added more to payroll this fall, anticipating a stronger holiday shopping season. Wal-Mart (WMT) added 10% more seasonal staffers than last year, while Kohl's (KSS) hired 34% more. UPS (UPS) and FedEx (FDX) are also augmenting their ranks more than last year. While November's surge had a strong seasonal component, the the underlying trend has clearly shifted to a faster pace, O'Keefe said. Wages still aren't growing: Average hourly earnings rose by a stronger-than-usual 0.4%, though the measure is up only 2.1% for the year. Stagnant wages have been a concern for works and the economic policymakers at the Federal Reserve. Wage growth still remains muted, likely because employers still have their pick of job seekers, especially as discouraged workers start sending out resumes again. So companies haven't felt compelled to offer higher salaries. That's changing, though, said O'Keefe, who expects earnings growth to pick up soon. Encouraging signs: Many employers are putting out the "Help Wanted" sign. Take Sitel, a global customer service outsourcing firm headquartered in Nashville, Tenn.
Sitel is so busy fielding its clients' customer inquiries that it is adding 5,700 jobs in the U.S. to the roughly 13,000 positions it has now. Nearly all the domestic jobs are full-time with benefits, Erickson said. Looking ahead to 2015, Erickson expects to continue adding staff. "I don't see any slowdown," he said. Young workers still struggle: While hiring is picking up, many of the jobs aren't high-paying ones. Millennials, in particular, have lost ground, according to a new report from the Young Invincibles, an advocacy group for that generation. Median annual wages have fallen in nearly all of the most popular industry sectors that employ 25 to 34-year-olds over the past decade. In retail and wholesale trade, which employs the largest share of these older Millennials, median wages plummeted 15% to $25,000. Wages in the leisure and hospitality industry fell 5% to $18,000. Only healthcare, the second most popular field, saw wages grow, albeit by a paltry 2% to $30,000. "They are not finding the jobs they need to set them up for their long-term financial future," said Konrad Mugglestone, co-author of the report.